"Surely, after difficulty, comes ease" reads a verse from the Holy Quran (I am too tired to look it up for a citation). This is not a blog about religion, but rather an expression of my journey to create and finish Badin and the Secret of the Saami. So it is all about overcoming ease: Something which can be harder than the difficulty. After you get your mind around that one—it took me awhile too—you might see the patterns of life: Death and life are one in the same. People fear them equally. Difficulty can be equated with death and life can be equated with ease. When I am happy with an illustration, I am inclined to slow down and feel less anxious about moving on to the next one. This is the hardship of ease. As I finish this blog entry, I am in the middle of coloring the model sheets of the three main characters. After that, I must do the antagonist and a room. That's over 20 model sheets done. 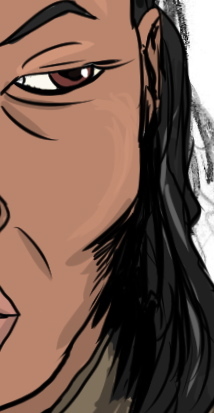 After that…I believe I can finally start illustrating the graphic novel. The model sheet abstract above is for one of the minor Saami characters. It was created from a pencil sketch that was inked and colored using Manga Studio 5EX.